Journalist Laura "Lo" Blacklock has scored the kind of assignment she has always dreamed of: a luxury cruise through Scandinavia aboard a ship with only 10 cabins. But one night she hears a scream coming from the cabin next to hers - a cabin that is supposed to be unoccupied. She heads out onto her veranda in time to hear something heaved overboard and to see blood on the railing. She tries to report what she assumes is a murder, but nobody will believe her. All the passengers and staff are accounted for, and the cabin in question was pristine only minutes after she reported the crime. Yet another wildly popular crime novel, this one drew me in because of the gaslighting. I'd been sort of interested in this author for a while (I've also heard great things about In a Dark, Dark Wood) but after hearing someone on a podcast talk about the more psychological aspects of the book, I was sold. Lo is dismissed because of a few factors that supposedly point to her being unstable and unreliable. Before the cruise, a man broke into her apartment while she was there and though she was unharmed, she was quite shaken, unable to sleep and rather on edge. She also takes medication for anxiety, and drinks a lot. Therefore, she must be hallucinating. 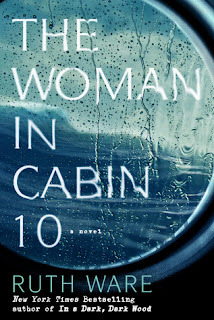 When I began reading, I became almost immediately distracted by the idea of a cruise ship with only 10 cabins. I had to put the book down and do a little internet research to find out if this is actually a thing, how big that boat would be, and - most importantly - whether this should go on my list of vacation ideas. Although it was a great premise for a story, it didn't quite capture me the way it apparently has some people. I felt like the first third of the book was Lo complaining about how tired she was and how much her head hurt. And also, she was really stupid. When people wouldn't believe what she witnessed, she kept pushing it even after receiving anonymous threats. She also kept telling people more than she should, considering they could actually be the killer and/or the person threatening her. There were, of course, bad consequences. Any reasonable person would have taken a hint after their story was dismissed, waited to get onto dry land, and then reported it. Why would you draw so much attention to yourself and point out that someone in your group is a murderer when you are all still trapped on a boat together in international waters? When all was said and done, I found the story rather convoluted and the reveal a bit of a letdown. I liked the idea of the story and kind of liked the main character despite her being rather dense, but I'm not sure why the book is so incredibly popular. It wasn't an unpleasant way to spend a few hours, but I've read better crime novels that didn't get nearly this much attention.